This is not going to win awards for best looking. You might not even click on it based on the photo. This is what I would call camp food. Hearty. Meat and potatoes food. Easy to heat up for kids coming in late from soccer practice. Heats well the next day for leftovers. 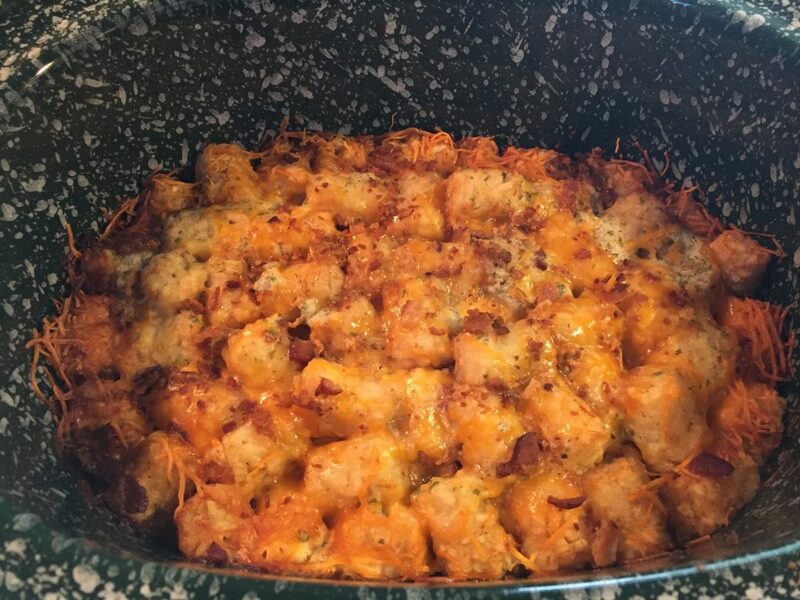 The ONLY casserole my child will eat. He is not a fan of food touching each other. It’s just wrong. Unless the foods are: cheese, bacon and ranch. For this, he will make a one-time exception. 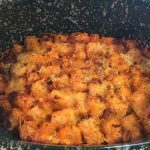 I honestly don’t remember where I found this recipe although I know it was on the internet! I was far down some rabbit hole, clicking on this and that when I discovered it. The good thing is – it’s a little like tacos. You can sort of make it the way you want. It’s adjustable and forgiving. It’s more of an idea than a recipe. If you are ready to make this, let’s do it! 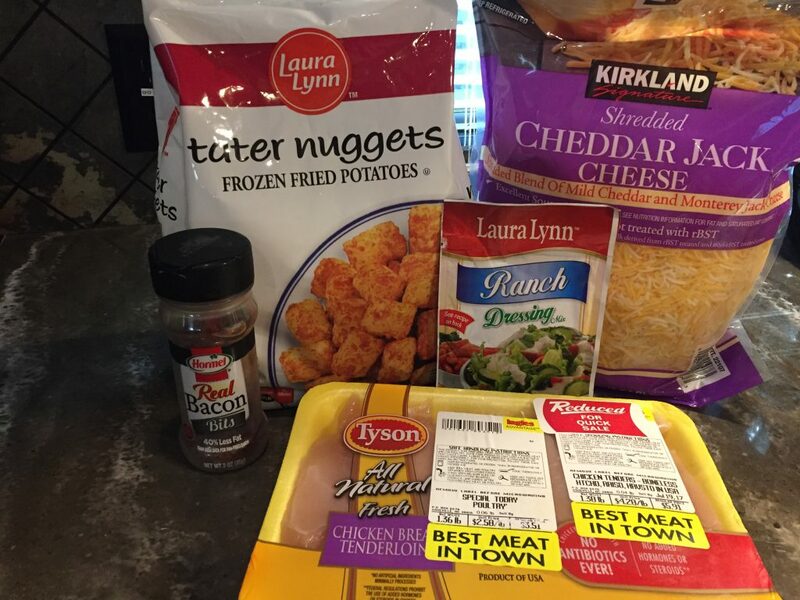 Remove the chicken pieces from the packaging and cut into bite size pieces. Chicken breast actually works better for this but I found chicken tenders on sale so that is what I am using. I know raw chicken is not a pretty sight, so look away and scroll at the same time – if need be. This is a public service announcement. 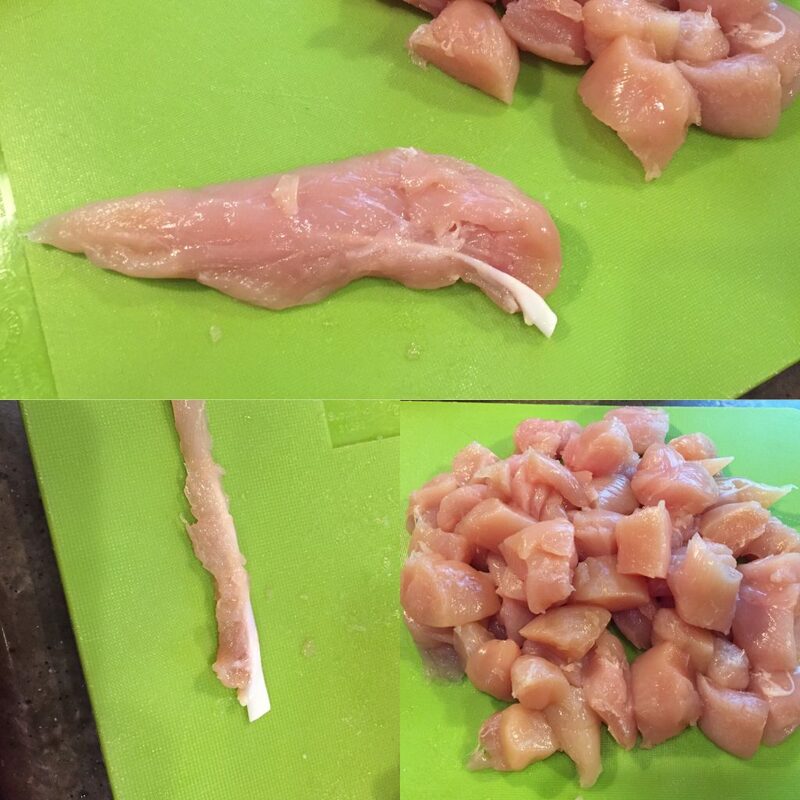 If you are using chicken tenders, make sure to remove the white tendon (or whatever that is!) that is shown in the picture. Otherwise, you will end up with some weird chewy white pieces. Gross. Cut those off now. Ok, the grossness should be gone now. I sprayed my slow cooker with cooking spray and then poured half of the bag of tater tots in the bottom of the slow cooker. Make sure they are in one layer. 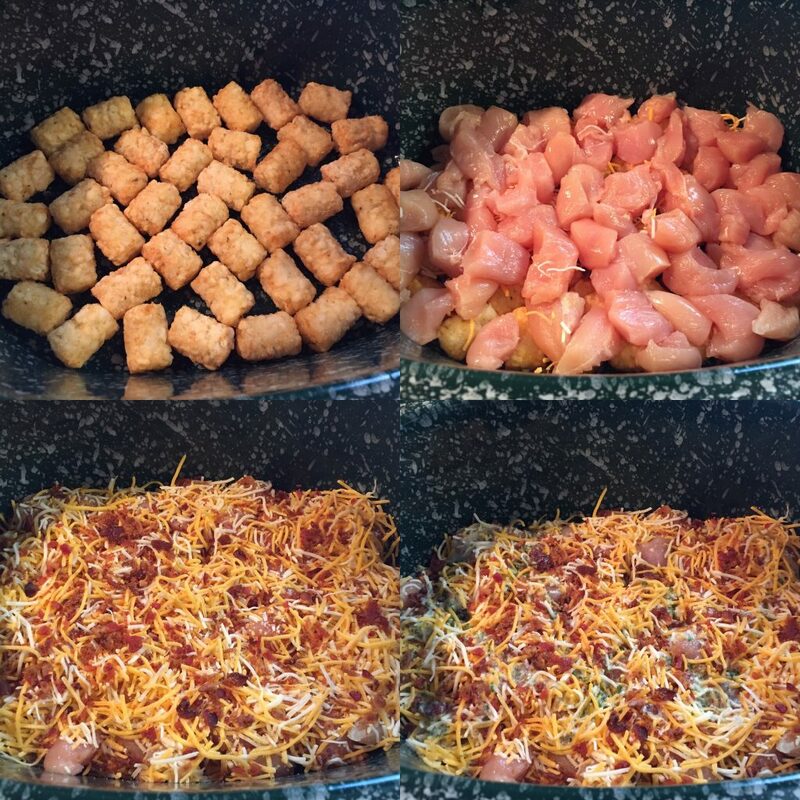 Then put all of your bite-size chicken pieces over the tater tots. Then sprinkle about 1 c. or so of the shredded cheese on top. Sprinkle some bacon over the top. I don’t measure the bacon but I estimate maybe 1 Tbsp. over the cheese layer. 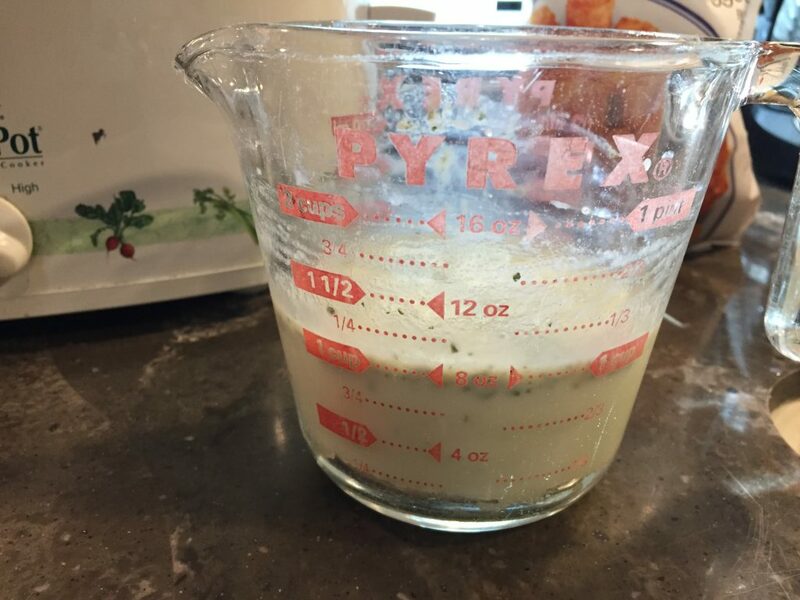 Mix the ranch dressing mix with 1 c. of milk. Pour 1/2 of this over the cheese and bacon. Then finish by doing one more layer. Tater tots, cheese, bacon and the rest of the ranch mix. Put the lid on the slow cooker and set on low. Cook for 5-6 hours. If you find you like the recipe but want a change, you could substitute leftover taco meat (cooked) for the chicken and top with taco toppings. Or you could grill the chicken and this could just be a cheesy side dish. You decide! If you find you like the recipe but want a change, you could substitute cooked taco meat for the chicken and (after cooking) top with taco toppings – like sour cream or salsa instead of using the ranch seasoning. Or you could grill the chicken and this could just be a cheesy side dish. You decide!